MB&F and Swiss pen-maker Caran d'Ache combine their creative and technical expertise to present the ASTROGRAPH writing instrument. Maximilian Büsser daydreamed of space exploration since childhood. 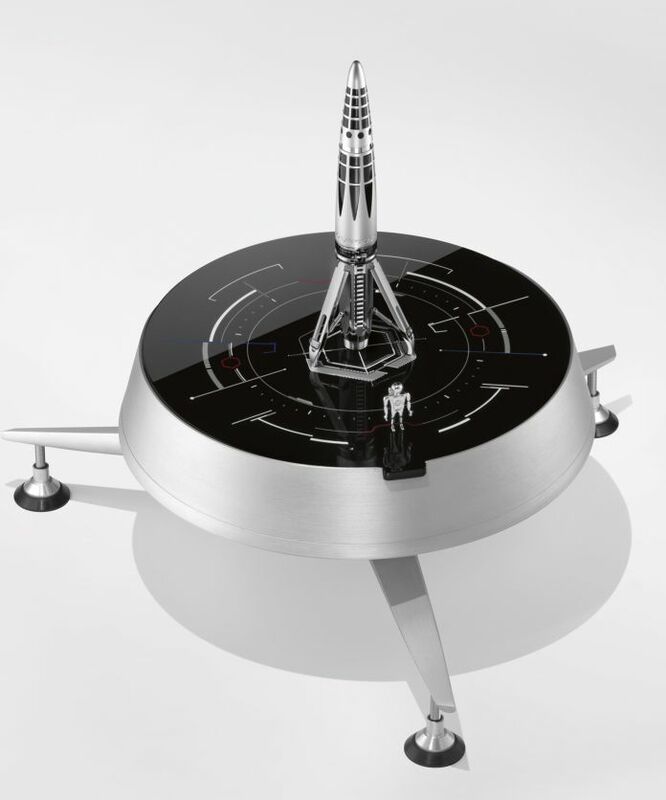 After the space-themed table clocks co-created with L'Epée 1839 and the space-themed music boxes co-created with Reuge, he joins creative and technical forces to with Caran d'Ache to co-create the ASTROGRAPH. 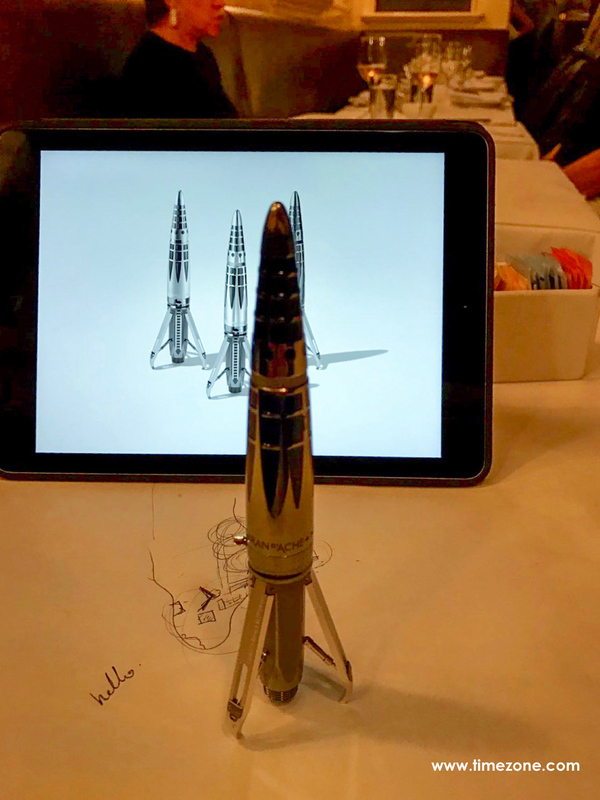 The ASTROGRAPH is a mechanical rocket pen, complete with rocket-shaped fuselage, miniature astronaut, shock-absorbing "switchblade" landing gear and a case designed like a launch pad. The ASTROGRAPH is an artistic union of creativity, respect for traditions, impeccable Swiss Made quality. Fabricated from 99 component parts, the ASTROGRAPH is the most complex writing instrument Caran d'Ache has ever crafted. Available either as an 18K gold-tipped fountain pen or a rollerball, each pen is limited to 99 pieces in tribute to the total number of its parts. 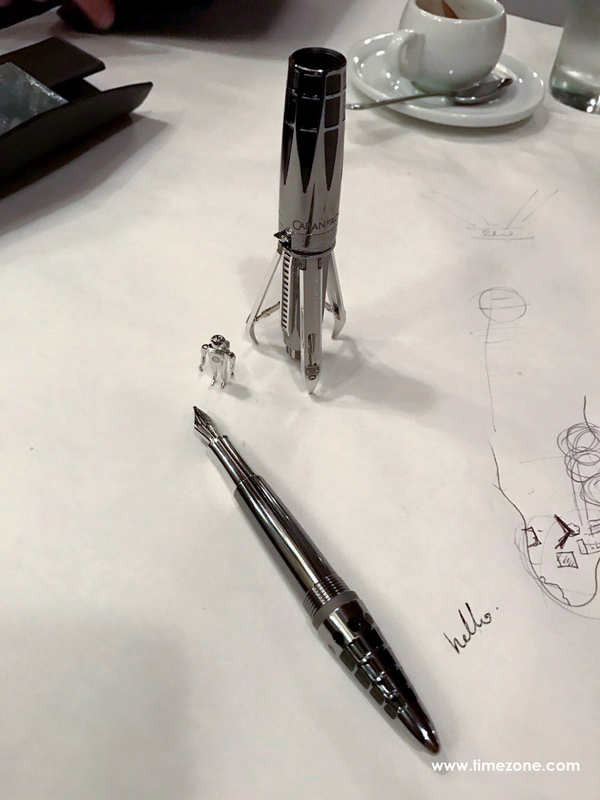 The ASTROGRAPH adventure began four years ago, when Maximilian Büsser met with the Caran d'Ache's creative team to inquire whether his childhood dreams of travelling to space could be realized in a writing instrument. His meeting with Caran d'Ache paved the way for this poetic and technically challenging pen that is slim, curved, well-balanced and extremely comfortable in the hand. 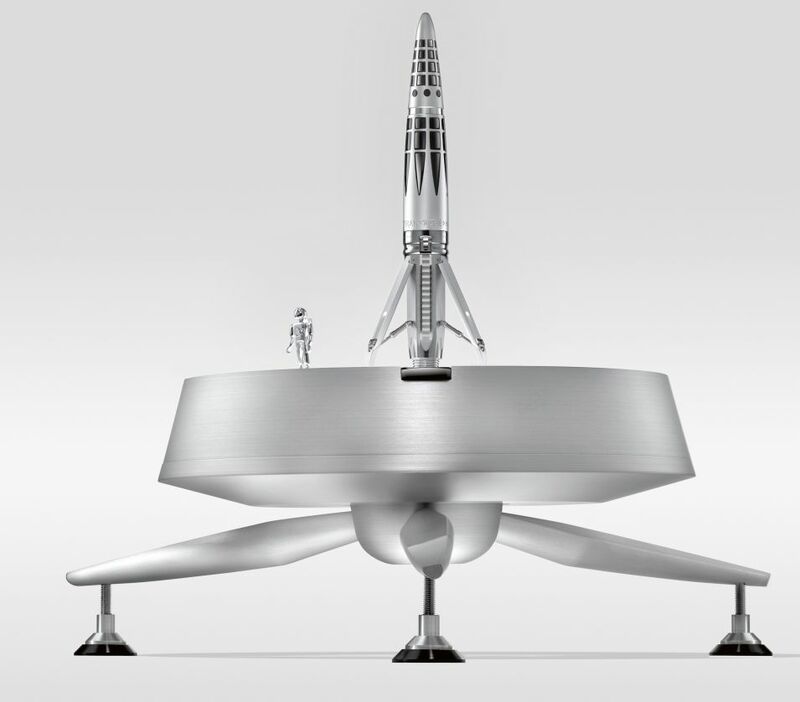 Developing the ASTROGRAPH required four years of development to design the futuristic body and its innovative features, including the "detent" system of vertical stabilisation, launch-pad box and magnetic figurine. It takes more than 500 manual operations to produce each writing instrument. The slim, curved body of the ASTROGRAPH, is immediately reminiscent of the outline of a space rocket. Its fluid design is accentuated by a chequered pattern, enhanced with anthracite lacquer a particularly delicate process carried out by craftsmen and a speciality of Caran d'Ache. The proportions have been designed to ensure that the whole body is perfectly balanced so that it rests perfectly in the hand. 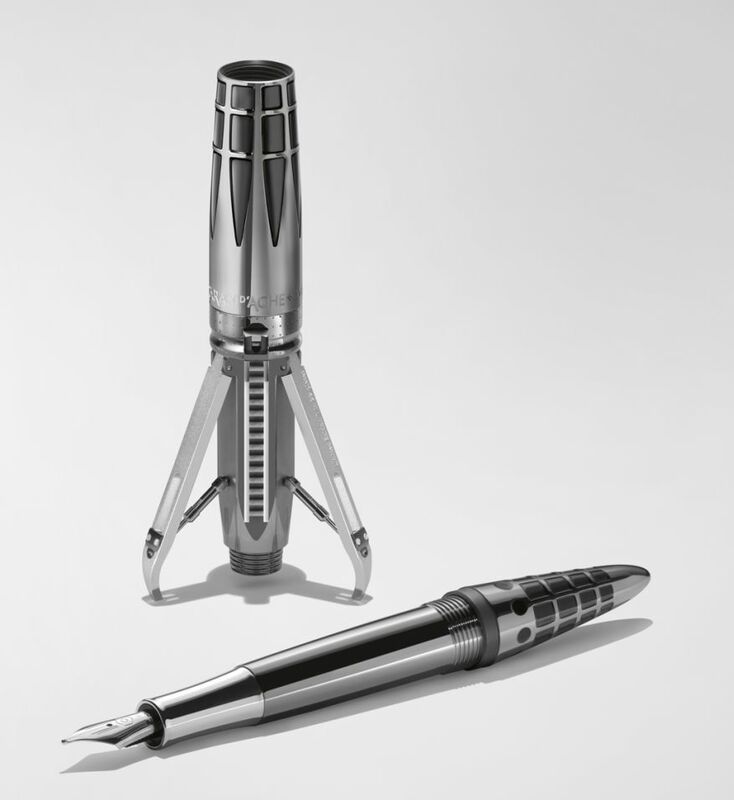 The structure is articulated by an ingenious mechanism inspired by penknives: a miniature lever the entry door to the rocket, concealed in the ring of the pen activates the simultaneous and symmetrical lowering of three stabiliser legs. 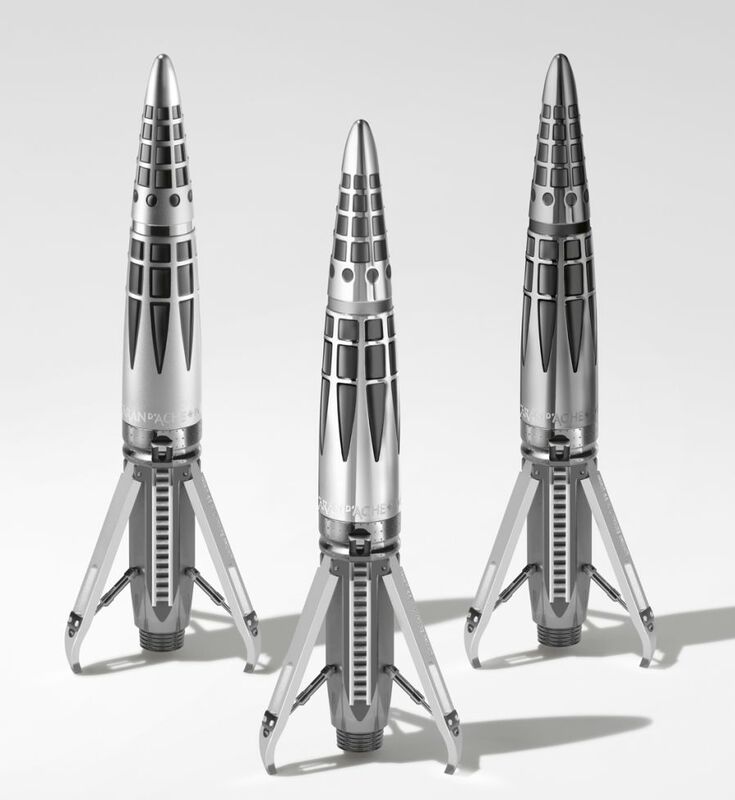 These, just like the miniature ladder than runs alongside the "thruster engines" have parts that are sandblasted, satin-finished and rhodium-plated. Once the stabiliser legs are deployed, it is possible to stand ASTROGRAPH up, vertically, ready for take-off. 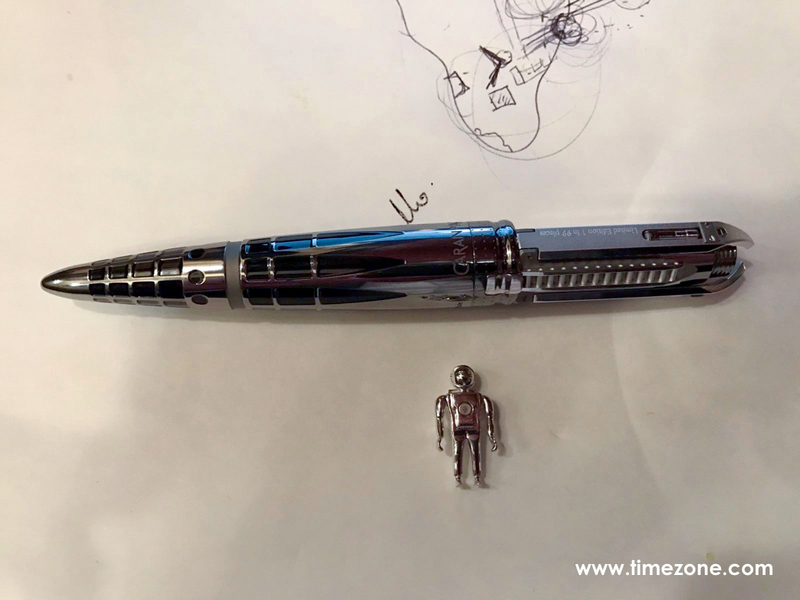 The ASTROGRAPH rocket also comes with a miniature figurine of an astronaut. 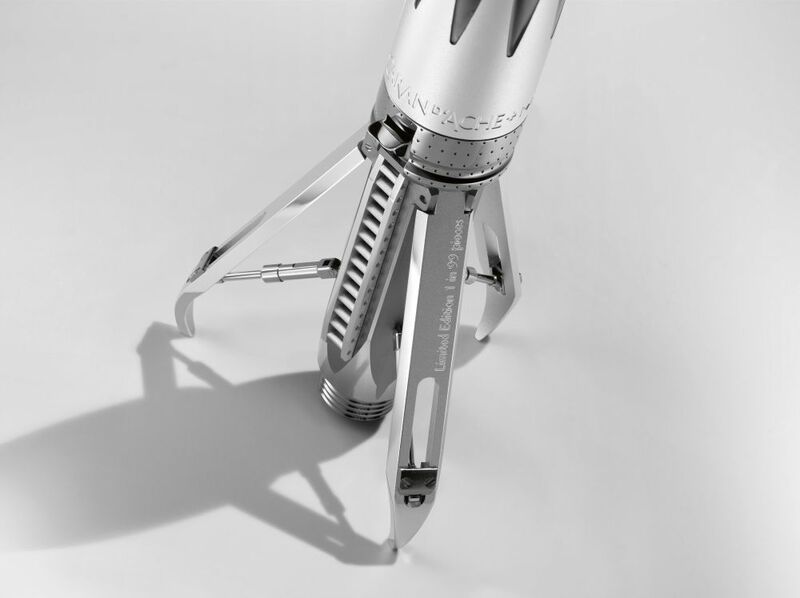 Rhodium-plated and magnetised, it will attach to any part of the body of the instrument, ready to "climb on board". Just for fun, a presentation box in the form of a launch pad has been specially devised for Astrograph. The ASTROGRAPH is available in three finishes: high-gloss rhodium, sandblasted matt rhodium or anthracite ruthenium. Price is $19,000. This writing instrument is fitted with a Caran d'Ache roller pen cartridge. Connected to the base of the "engine", the ring is decorated with the logos of Caran d'Ache, of MB&F and of Swiss Made.